Traditional audits play an important role in assessing working conditions throughout the supply chain. But the role of audits in a “beyond compliance” world is changing. A focus on compliance is not enough to drive improved business performance, working conditions, and buyer-supplier relationships. To enable “beyond compliance” audits with greater impact, we need to build from high quality audits to effectively identify factory risks, while also utilizing technology to engage workers in real time throughout audit processes. This will help drive greater visibility and transparency – key components that are the foundation for real and sustainable improvement actions. Starting in 2018, ELEVATE Responsible Sourcing Audits (ERSA) will include a worker survey – first in China and then within our global services. By incorporating a worker survey into the full audit package, it is now possible to get a 360 degree view of the factory. Workers are surveyed using anonymous, mobile technology, yielding unique insights about their factory conditions and levels of satisfaction. This information is an immediate complement to audit findings – the insights add differentiated perspective about possible risks, areas for improvement, and better ways to engage and retain a factory’s workforce. 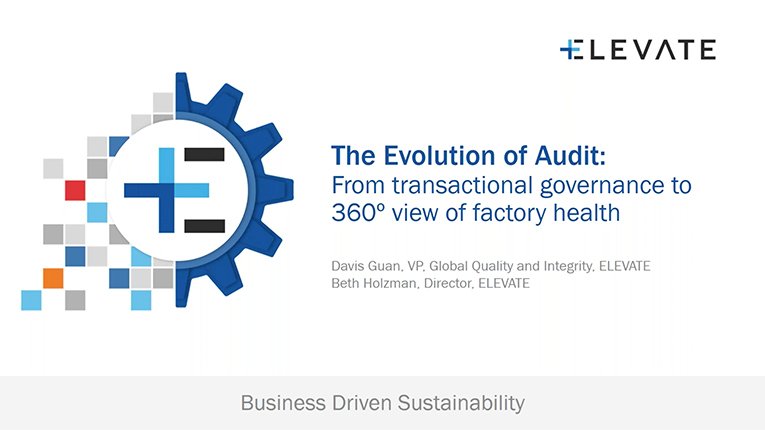 Join ELEVATE leaders from China and our Worker Engagement team to learn more about the changing landscape of audits and tools that can provide more actionable information that benefits all stakeholders. Our successful focus on transparency, quality, improved data & analytics, and a new focus on bottom-up insights all provide concrete steps to truly move “beyond compliance”.